A couple of weeks ago I mentioned that I was going to try to use items that were in my pantry rather than buying new food ALL THE TIME. I was going to limit my trips to the grocery store to once per week. I’m happy to say that I have been sticking to those goals. I have only been to the grocery store twice during the past two weeks and I’ve been creating recipes and making meals using items that are already stocked in my pantry, like this quick quinoa bowl. I feel like I’ve made a great accomplishment and I’m very proud of myself for sticking to the new rules and goals that I’ve created for myself. Another goal that I didn’t mention was to become more organized. First battle: my refrigerator. My refrigerator used to look like a hot mess. Containers, condiments, veggies and beer were packed into the fridge in an unorganized mess. I spent what seemed like hours (ok, exaggeration) looking for the leftover black beans or the bag of cilantro that I “knew” were somewhere in there. The neatly stocked refrigerators that I saw on numerous HGTV shows made me a little jealous. I want that fridge. I want my fridge to look like that. Look how nice that is. Can I have that? I went shopping at Target on Sunday, a day that the pyrex glass storage containers happened to go on sale. I bought a lot of those containers because I knew they would make my refrigerator look nice and tidy while storing leftovers and because I desperately wanted to break up with my collection of annoying tupperware containers. I also bought 3 refrigerator baskets to hold miscellaneous containers, condiments and beer. I spent Sunday afternoon organizing my refrigerator with my new toys. It time spent well and I was extremely happy with the finished product. I boasted many times to Ken about how good our refrigerator looks now. It doesn’t even look like the same refrigerator anymore. At least the inside doesn’t, anyways. it has a little crunch, thanks to the pine nuts. it contains healthy fats, fiber and vegan protein. it’s cholesterol free, low sugar and low sodium. it’s under 500 calories for a generous serving. Freshly ground pepper and kosher salt. Place the quinoa in a serving bowl. Top with the tomatoes and then drizzle the tomatoes with balsamic vinegar and olive oil. Sprinkle with pine nuts and chopped fresh thyme. Sprinkle with generous portion of ground pepper and a little kosher salt. serving or split with a friend and serve with a salad. To roast the tomatoes, place them in a baking dish and drizzle with a little olive oil and sprinkle with a pinch of salt and pepper. Place in your oven and broil until slightly charred, about 5 minutes. 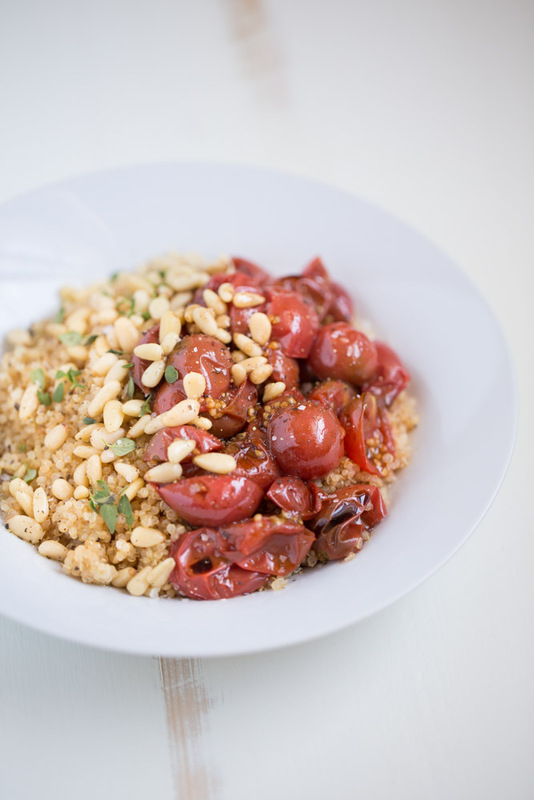 Okay, i am biased and anything out of a bowl I go gaga over- this looks SO good and those roasted tomatoes! Thank you, Arman! I’ve been gaga over roasted tomatoes for ages now! Oh yummy! 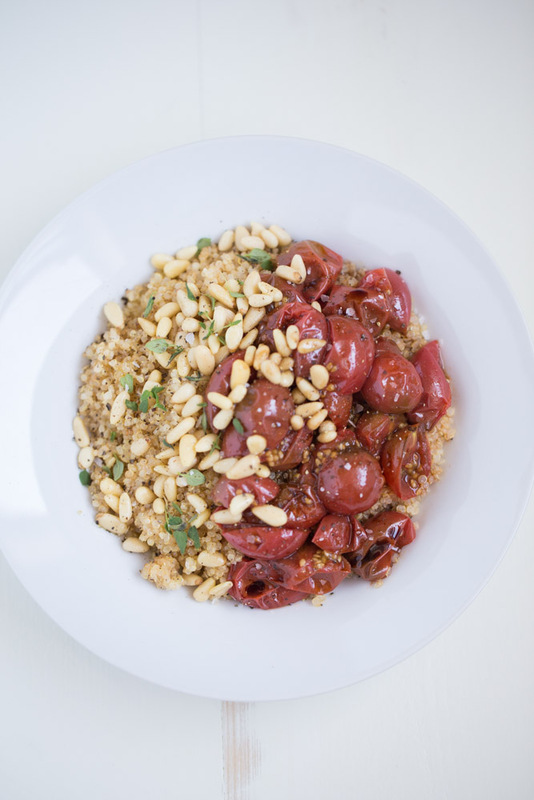 I am in love with this gorgeous looking quinoa and roasted tomatoes bowl. So much yes to this quick and easy bowl packed with good health. What a great way to use what’s already in the pantry! Wow, this looks amazing! Love the idea of this kind of bowl for dinner. YUM. This looks fantastic! I love the idea of cleaning out your pantry before stocking it with new stuff. It’s a great thing to do, especially when you have a tiny pantry like mine! Thank you for stopping by, Kelley. This bowl needs to appear now in my kitchen!! Ahhh I need to do the no grocery trips thing and clean out the pantry and freezer! Love this delicious option you came up with! Looks amazing! Even the meat lovers can take a break and enjoy this bowl. Thanks for joining the Thursday Favorite Things Blog Hop! You are giving me some motivation to clean up my fridge and use up what is in the house too. I’ve been saying I need to do that forever. But have I done it. No. On to your recipe though, it looks delicious! 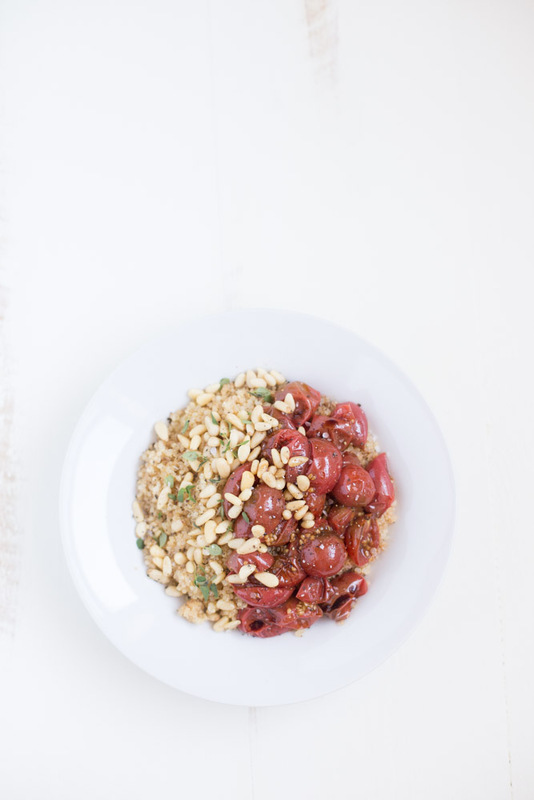 I am a huge fan of roasted tomatoes…I love the flavor it brings out in them. My family would definitely like this. Thanks for the recipe! :) Pinning and sharing. This looks delicious and a great way to use up what you already had. Thank you for linking up at #HomeMattersParty and hope to see you again soon!